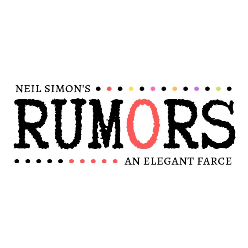 Join us for the inaugural production of the brand-new Milton Community Theatre: the Neil Simon farce "Rumors." Join us for the inaugural production of the brand-new Milton Community Theatre: the Neil Simon farce "Rumors." At a large, tastefully-appointed Sneden's Landing townhouse, the Deputy Mayor of New York has just shot himself. Though only a flesh wound, four couples are about to experience a severe attack of Farce. Gathering for their tenth wedding anniversary, the host lies bleeding in the other room, and his wife is nowhere in sight. His lawyer, Ken, and wife, Chris, must get "the story" straight before the other guests arrive. As the confusions and mis-communications mount, the evening spins off into classic farcical hilarity. Recommended for ages 13 and up.